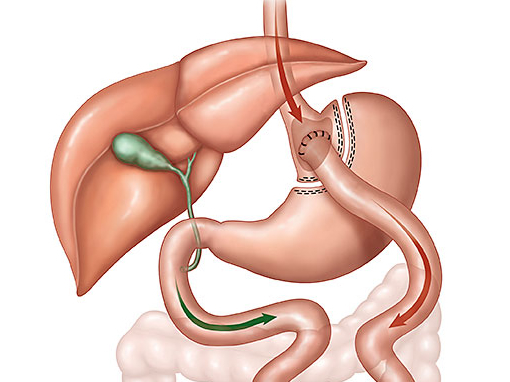 The Roux en-y Gastric Bypass (RYGB) is considered the “gold standard” of modern obesity surgery — the benchmark to which other operations are compared. RYGB works to help people lose weight by three, primary and interacting benefits: Restriction, Metabolic Changes, and Malabsorption. Restriction occurs because the stomach is divided and a much smaller stomach or “pouch” (about the size of a walnut) is created. When a person who has RYGB eats, the food enters this new, much smaller pouch and the result is the person feels full and satisfied with significantly smaller portions of food. Malabsorption occurs because the length of the small intestine available to absorb calories is shortened. This occurs because the surgeon divides the upper portion of the small intestine in half. The lower portion is attached to the pouch; The other section of the intestine is attached lower down on the small intestine. Calories and nutrients are still absorbed by the intestines but because the length of the intestine is now shorter, there is less opportunity for absorption compared to before surgery. What are the advantages and disadvantages of RYGB? 1) Is technically a more complex operation than the sleeve and potentially could result in greater complication rates. 2) Can lead to long-term vitamin/mineral deficiencies particularly iron, calcium, folate, thiamin, vitamin D, and B12. 3) Generally requires a longer hospital stay than sleeve. 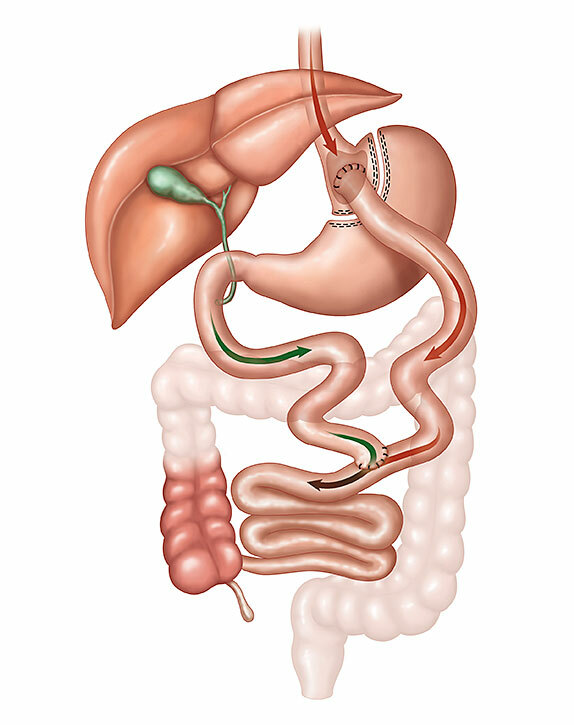 The Roux-en-Y Gastric Bypass generally takes 1 1/2 to 2 hours to perform. Following the procedure, you will be carefully monitored and spend an average of 2 days in the hospital if the procedure is done laparoscopically, 4-5 days if you have an “open surgery”. How does Roux-en-Y Gastric Bypass help people change behaviors? Will malabsorption cause me to become malnourished? There is a risk of becoming malnourished after Roux-en-Y Gastric bypass. This is due primarily to the shorter small intestines. In order to avoid malnourishment, you will need to take consume adequate amounts of macronutrients (protein, carbohydrate, and fat) and micronutrients (vitamins and minerals). Regarding micronutrients, you will need take vitamins every day for the rest of your life. For most people the vitamins include a multivitamin and calcium. Some people, especially menstruating women, need to take additional iron. In case all this seems overwhelming and confusing, fear not. As part of our bariatric program, we will teach you about the macronutrients and micronutrients you will need and we will monitor your nutritional status very carefully. If you follow our simple guidelines, malnourishment is very unlikely to occur. When I am 65, I will be walking, dancing, and enjoying life! 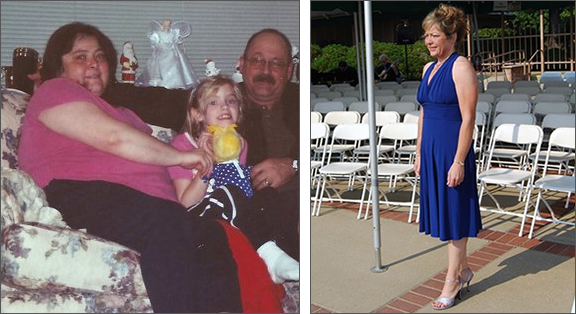 One year and four months after gastric bypass, I am feeling GREAT! I am healthier that I have ever been. I can breathe and I can walk! Looking over my before pictures I realized that I didn’t realize (does that make sense?) how big I had gotten. I am so glad that I have committed to making the life change.